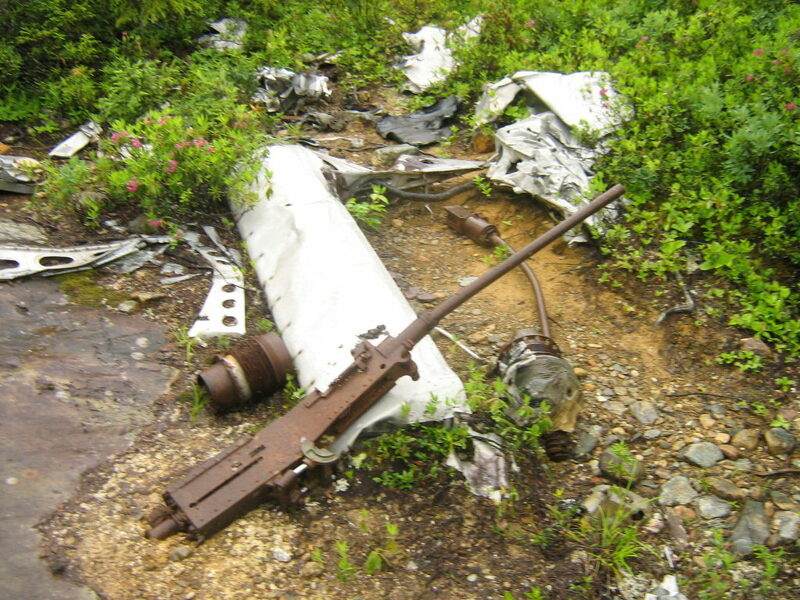 The last post looked at the B-17 that can be found in the Thomas Howe Demonstration Forest in Gander, and discussed what can happen to sites when they are not offered protection but yet are accessible to the public. Prior to the creation of Thomas Howe, the highway was put through the area and the crash site became much more accessible. Due to its accessibility, a lot of the wreckage has been removed. It’s a common theme, and happens whenever a road passes near a site. I’m not saying that everything needs to stay just as it is, but if aircraft material is removed from a site without anything being recorded, the information it can give is lost. This information can give more information about what happened, but if all that is left are a couple of landing gears (figure 1) and bits of steel, the site can really tell us nothing about what happened. Figure 1: Landing gear with some evidence of fire. Photo by Lisa M. Daly, 2010. In the Gander area, USAAF B-17 44-6344 can be found between the Thomas Howe Demonstration Forest and the Silent Witness Memorial. 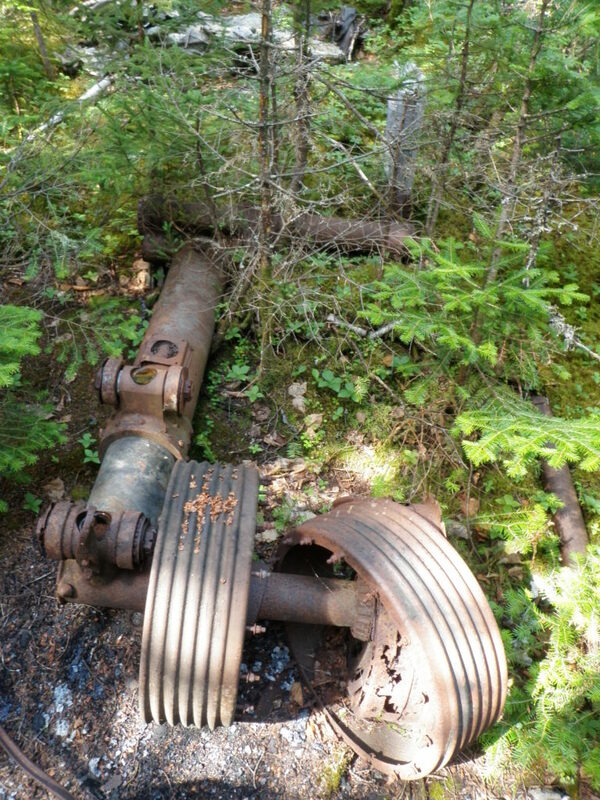 It is just off the Trans-Canada Highway, and is relatively accessible. For this reason, there is very little that remains on the site. 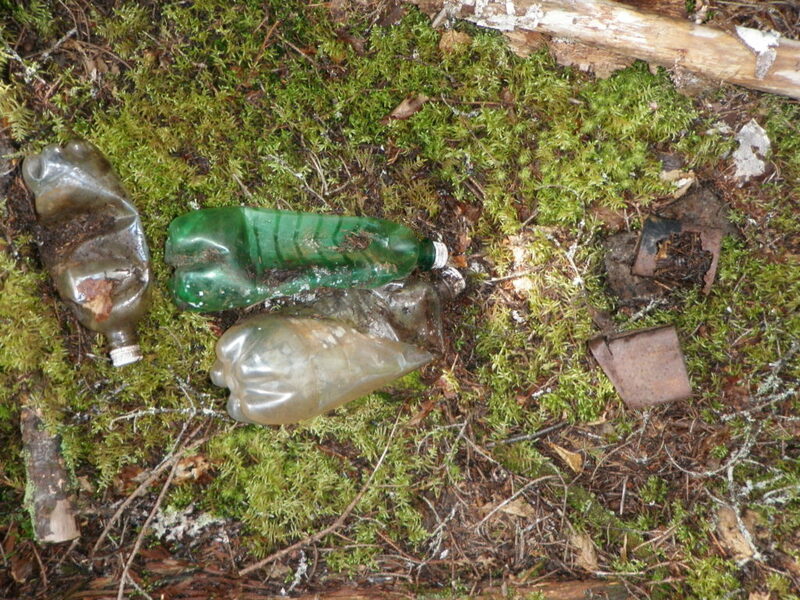 In fact, there is what looks to be a fire pit where people who were visiting the site stopped and had a lunch, leaving behind their pop bottles (figure 2). Figure 2: Modern pop bottles on site. Photo by Lisa M. Daly, 2010. 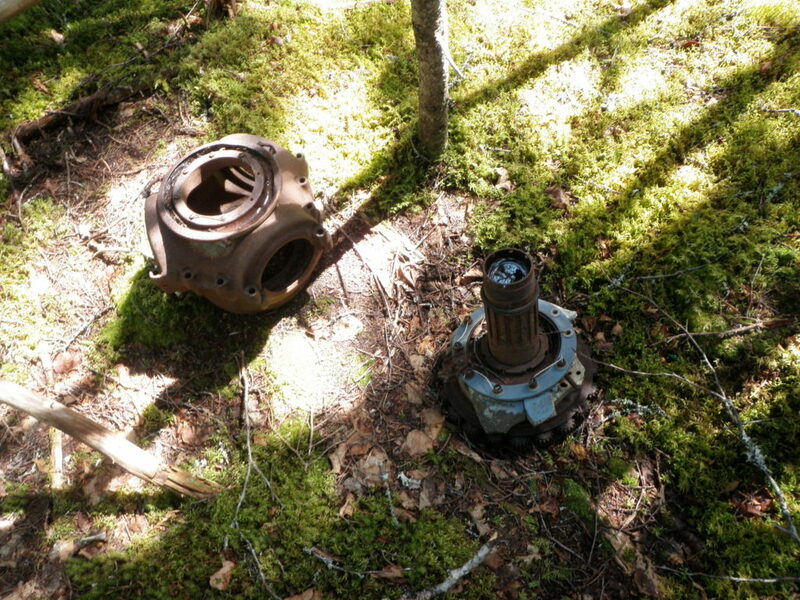 Figure 3: Propeller hub on site. Photo by Lisa M. Daly, 2010. Air traffic on the North Atlantic crossing was severely impaired. At the time our aircraft was scheduled to cross, planes were beginning to “pile up”, awaiting weather, and it became necessary to move them out. On approximately August 4th we were scheduled to fly the next leg of our trip – Gandar [sic] to Azores. Our crew was briefed for the flight and we were assigned the position of number 3 for takeoff. As we taxied toward the end of the runway we could see in the east lightning and bad weather from an approaching storm. At the end of the runway we stopped while number 1 took off. He cleared the end of the runway successfully and disappeared into the murk of the approaching bad weather. Number 2 pulled out on the runway and accelerated for take off. As number 3 we pulled out behind the vacated area and began engine acceleration for our own take off. Number 2 cleared the runway and climbed slightly then heeled over and crashed into the ground. The sky lit up. As number 2 struck and caught fire, our pilot accelerated our engines and we began to roll toward our own take off. We cleared the end of the runway and lifted into the air slightly and flew by the burning wreck of number 2. It was a boiling sea of flames. No one escaped alive. We passed, gained altitude and were immediately in a zone of St. Elmo’s Fire. A ring of sparks marked the tips of our four rotating propellers. Arcs of static electricity began to dance though the aircraft. […] After a few minutes we left the disturbed weather. I had a clear sight of St. John’s which I used as a point of departure for our flight to the Azores (pers. comm. 2 Aug 2013; see table for crew). Crew list for USAAF B-17 44-6344. Adapted from Blackeslee et al. 1944. One pilot, Stanley L. Anderson, attempted to contact the control tower to inform them of the crash, but other aircraft interfered with getting through. After trying four times, Anderson went directly to Control Operations and informed them of the crash. The subsequent investigation could not find the cause of the accident, but believed that it was due to an engine stall. 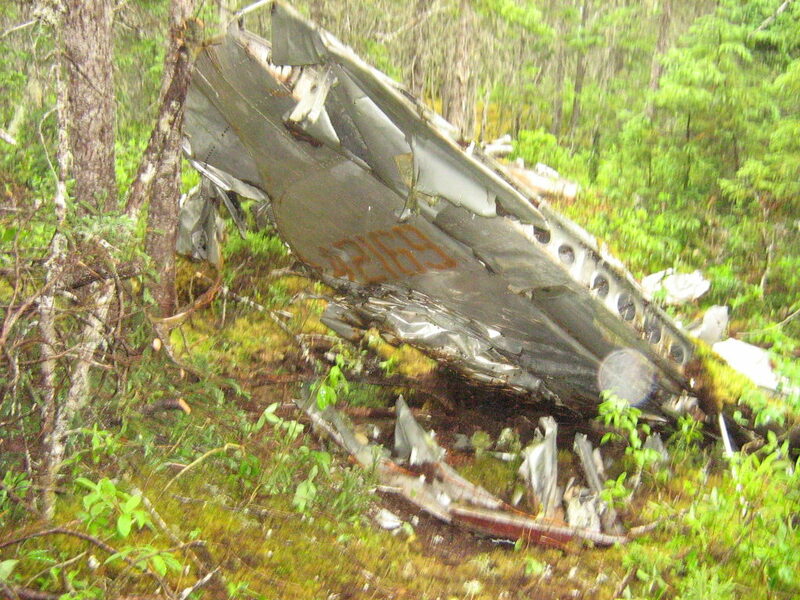 The aircraft had had some maintenance done on its flight indicator, but the investigation found that this was not a factor in the crash (Blackeslee et al. 1944). Figure 4: Melted aluminum. Photo by Lisa M. Daly, 2010. As previously stated, there is very little left to this aircraft, just a few larger pieces like landing gears. All aluminum and copper has been removed from the site, except for a little bit of melted aluminum (figure 4). 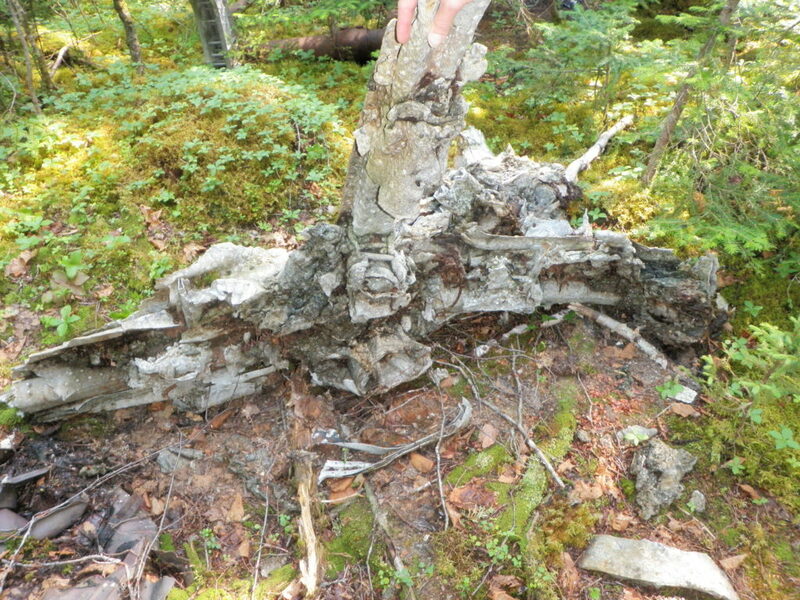 According to Frank Tibbo, some of the damage was due to a forest fire in that area, and the scars of that can be seen in how the area has fewer trees than the surrounding forest. 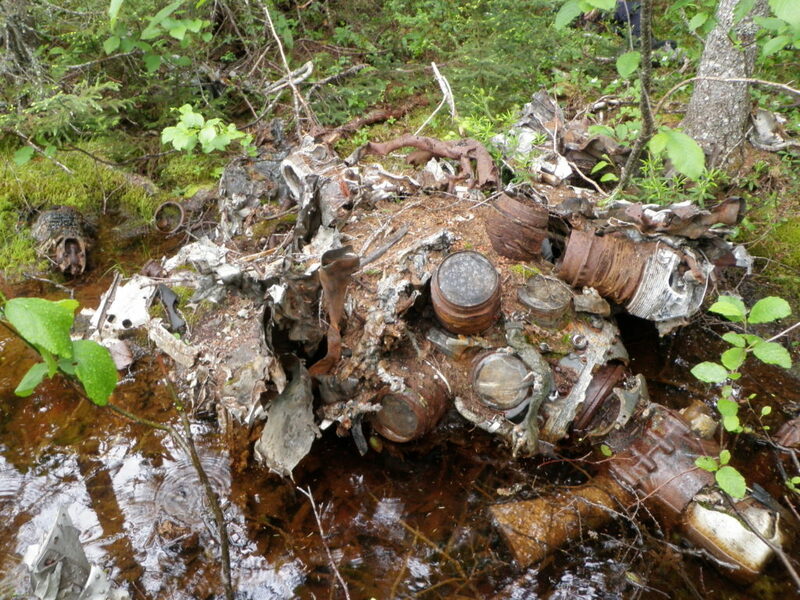 It is unknown if the melted aluminum is from the heat of the crash or the later forest fire. That said, some of the wreckage could have been removed when highway crews were putting in a culvert close to the site, or some could be covered by the highway (figure 5). 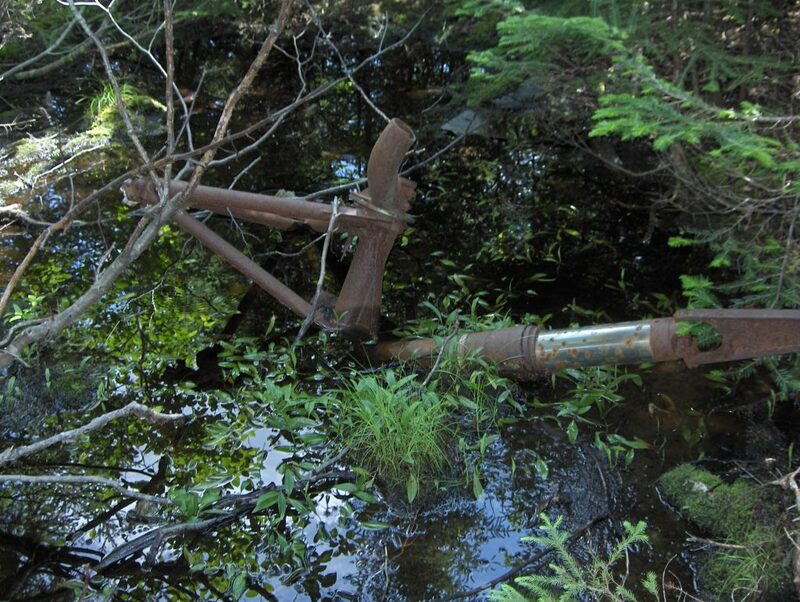 Figure 5: Wreckage in the drainage ditch near the highway. Photo by Shannon K. Green, 2010. This site is an example of what can happen to sites if they are accessible and not protected, especially when the cost of scrap metal is high. Most sites I have visited show at least some evidence of trying to remove aluminum, and I have been asked by people “how much copper is still there?” which is usually a red flag to not tell that person where a site is located. While most people will respect a site, especially if there is some form of memorial present, it only takes a couple of people to completely destroy a site. 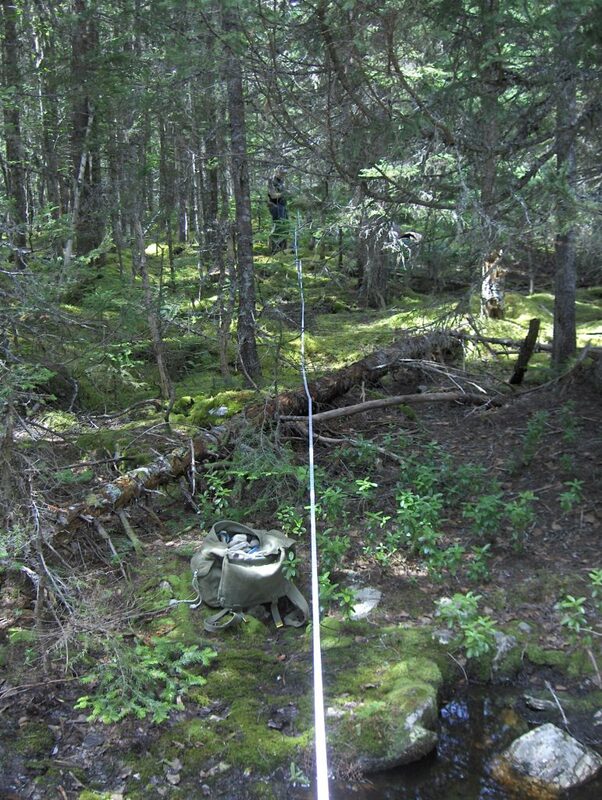 Measuring the artifacts on site. Photo by Shannon K. Green, 2010. 1944 War Department U.S. Army Air Force Report of Aircraft Accident. War Department, Gander, Newfoundland. Ms. available from http://www.accident-report.com/.